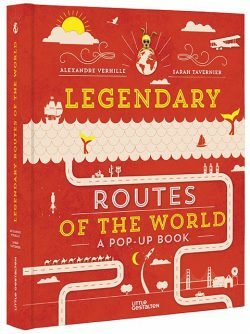 Legendary Routes of the World takes its readers on a splendid pop-up journey through some of the planet’s most famous itineraries. It includes the pioneering Aéropostale, which was the first French airborne mail delivery system that connected France with South America; the transatlantic single-handed yacht race dubbed the Rhum Route; the Silk Road connecting the Asian continent’s east and west through trade; Route 66 in the United States, which is ingrained in popular culture as the setting for countless travel narratives; and the impressive lunar expedition of 1969. 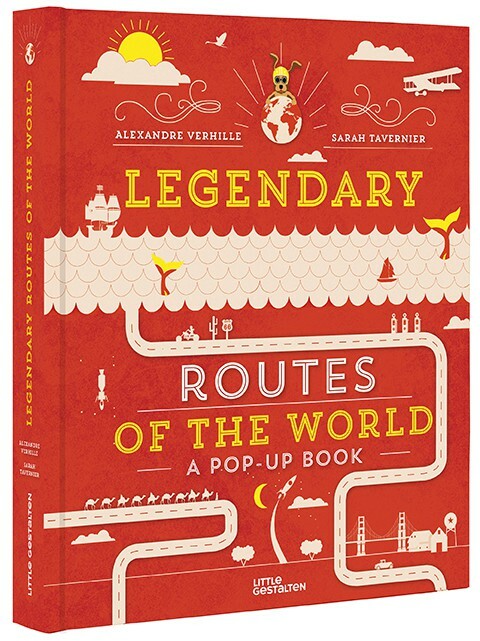 Each one of these legendary routes is inventively presented as a double-page pop-up spread accompanied by interesting anecdotes and information. This is a visually striking gift book whose clever engineering and iconic illustrations inspire wonder in both children and adults. Influenced by the writing of Jack Kerouac and Jack London, as well as the comics of Hugo Pratt, Alexandre Verhille ­creates illustrated maps for a variety of international newspapers and magazines. When he’s not making maps, he plans trips around the world and illustrates children’s and travel books. A visual artist with a degree from the European School of Arts and Materials, Sarah Tavernier works as a ­colorist and designer in the fields of architecture and illustration. For the last several years she has also focused on paper engineering and has invented and modified pop-up systems for children’s books as well as other projects.